If you aren't headed out of town for the next few weeks, then you probably have some relatives coming to visit. Here are some ideas that will take them to some great L.A. theaters, and not all of the shows are holiday themed, so you won't OD on Christmas carols – unless you want to. If you're family loves tap dancing, you've got to take them to see the Tony-winning revival of this classic Broadway show, featuring songs by Cole Porter, choreography and direction by Kathleen Marshall and starring the insanely talented Rachel York. 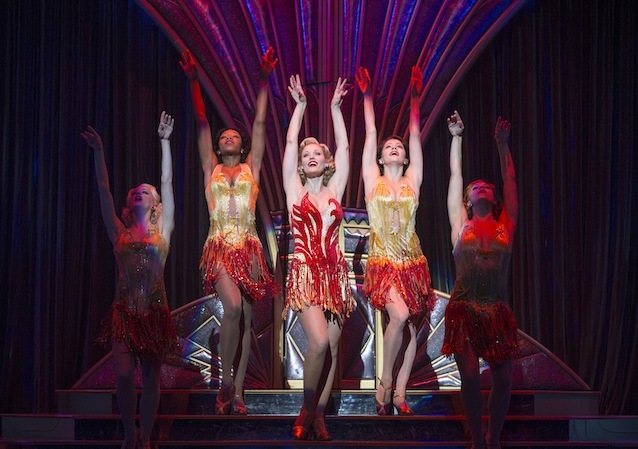 You probably won't even realize that you know most of the songs from "Anything Goes" until you watch the show. "A Christmas Carol: Twist Your Dickens"
The Second City's hilariously irreverent satire of A Christmas Carol was penned by two writers of "The Colbert Report" and features a cast of the comedy troupe's brightest stars, so you know you're in for a good time. There's no way your work's holiday party could top the crude hijinks of Finhead Insurance Agency's annual blowout. See small-town America at its zaniest. Shirley Abramowitz recounts the story of when she, a young Jewish girl, was cast as Jesus in her school's Christmas pageant to her great-granddaughter, illustrating the trials and tribulations of living in multi-ethnic America. Written by Pulitzer Prize winner Donald Margulies. "Donny & Marie – Christmas in Los Angeles"
You might know Donny and Marie from "Dancing With the Stars," but even if you have no idea who the Osmonds are, your parents will. So let them relive their childhood memories of watching Osmond Family Christmases on TV by seeing the brother-and-sister duo perform live. If all this singing and dancing isn't your thing, maybe a little bit of magic can tickle your fancy. Directed by Neil Patrick Harris, "Nothing to Hide" teams sleight-of-hand artists Derek DelGaudio and Helder Guimarães for a production that goes beyond any traditional magic show. Perhaps watching a dysfunctional family's drama unfold on stage will make you treasure your own loved ones even more. When a daughter decides to show her tell-all confessional novel to her family on Christmas Eve, it brings turmoil and conflict to their Palm Springs holiday. Every year the Troubadour Theater Company presents a new holiday mash-up, and this season's retelling of Rudolph's tale intertwined with recognizable tunes from the Doors, such as "Hello, I Love You," "Light My Fire" and "Break On Through (To the Other Side)," is sure to be unforgettable.